Man points gun at another driver in Sebastian. 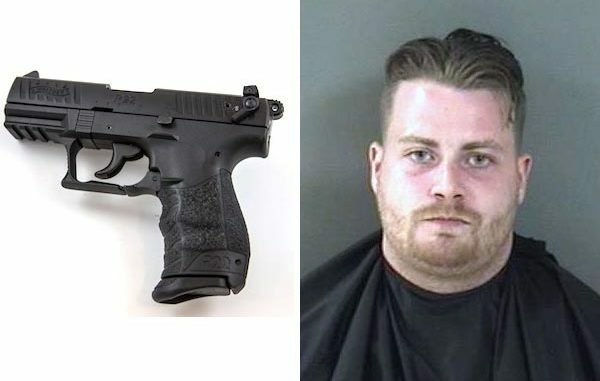 SEBASTIAN – A 25-year-old man was arrested in Sebastian after brandishing a gun during a road rage incident. Wesley Walden was driving southbound on U.S. Highway 1 when he made a U-Turn and headed north. During the U-Turn, he pulled out in front of two vehicles. One of the vehicles, a red Jeep, had to slam on the breaks to avoid hitting Walden’s silver 2-door Infinity. During that, Walden was in front of the Jeep and throwing his arms out of the sunroof and showing them his middle finger. Walden then moved into the right lane and pulled up next to them at the intersection of Schumann Drive and U.S. Highway 1 to “flip” them off again. When the light turned green, the victims in the Jeep started driving and then noticed the silver car was weaving in and out of cars to get back behind them. The victims in the Jeep were in fear of their lives, so they swerved into the right lane and struck Walden’s car because they thought he was going to start shooting. They pushed the silver car to the side of U.S. Highway 1, but Walden sped up and pulled ahead where he pointed the gun at them again. While the victims tried to follow Walden to read his license plate, he slammed on his brakes, and they rear-ended his vehicle. The victims drove to the Sebastian Police Department to report the incident. While there, Walden called from U.S. Highway 1 and CR-512 to report a hit-and-run involving a red Jeep. Walden explained that he was involved in a road rage incident with a red Jeep when his car was smashed twice before leaving the scene. He stated that before calling in about the accident, he went to a friend’s house in Sebastian. Police checked Waldon’s car for any weapons but couldn’t locate the handgun. Then they went to the friend’s house where two people reside at the residence. They said their friend “Wesley” showed up at their house and said he almost shot someone for smashing into his vehicle. They asked if Walden left any weapons at the residence, but they were unsure. After conducting a search, they found a black semi-automatic handgun in a drawer. The people at the home said the gun did not belong to them. Waldon admitted that the gun belonged to him and that he dropped it off at the residence because he’s a convicted felon. He said someone left the firearm in his vehicle and he placed it on his lap but never pointed it at anyone. Sebastian Police then found out the handgun was stolen out of Melbourne, Florida. Waldon was placed under arrest and transported to the Indian River County Jail. He was charged with Felony Carry Concealed Firearm and Felony Aggravated Assault With Deadly Weapon.